I'm kind of in love with the state of Massachusetts! According to the article, Dorcena had almost given up hope on getting a response from the Mayor - everytime she called his office to follow up, he was out (imagine that...an unavailable politician!). But in May, she finally received a letter announcing adoption of Margins. So stoked! Two fantastic articles came out this week about Margins! So far no bump in traffic from the Courant piece, but I'm hoping that people will curl up with their papers in their jammies over brunch and catch up on reading during the holiday weekend. You do have to sign in to read the article, but registration is free. "One Tiny Change Could Save Thousands of Trees" by Joann Klimkiewicz takes a look at the thrifty roots of the Margins campaign, as well as the campaign's goals. You can read it here. The past few weeks have been very encouraging, as the Margins campaign continues to make its way out into the world. I was recently contacted by the Washington Post and the Hartford Courant about doing pieces on Margins. Both pieces were supposed to come out this week. Not sure what's up yet with the Post, but many thanks to my friend Craig and his stepmom. She lives in Connecticut and found the article in the Courant (it's not online). She's sending me a copy and I'll post it as soon as I receive it. I'm a little nervous about the pieces. I'm used to being the interviewER, not the interviewEE...hopefully, I said a few things that were either mildly coherent or entertaining and don't make me sound like a jackass. I'm also curious to see the impact of print press vs. online press on the campaign. Over the past several months, every time there's been a mention of Margins online somewhere, the petition and site traffic have gotten a bump. I'm wondering if the same will hold true for print. If it's not as simple as clicking on a hyperlink to find out more about the campaign, will people actually make the extra effort to do so? Usually when the word "viral" pops up, I go running for a Z-pack from Dr. Goldberg. But when it comes to Margins, viral is what we crave. Thx to the following peeps/orgs for supporting Change the Margins. I've newly discovered Google Alerts, which is helping me to keep track of campaign mentions. 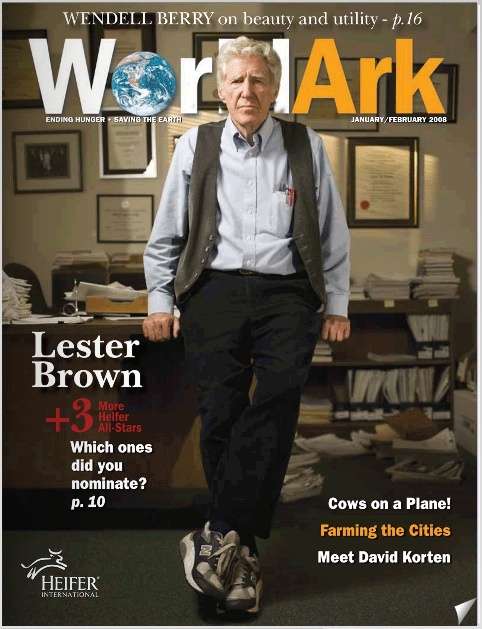 January/February issue of World Ark, a newsletter published by Heifer International, an organization dedicated to working with communities to end hunger and poverty and to care for the earth. They've put me up for their "Genius of the Month" award, which definitely makes me feel a LOT better about being the only person in my family who didn't go to grad school. Thanks to my dad who found the article randomly - he receives the publication because of his work with the non-profit org Prevent Child Abuse. While leafing through it he found the article and sent it my way. No Friday EyeCandy last week, as I was up in Park City at the Sundance Film Festival covering it for Documentary Magazine. While I was there, I got covered myself...by Glamour! Margins is going to be featured in their April 2008 issue as part of their Green Guide (not official title). Hopefully, I didn't sound like a complete idiot in the interview. The reporter didn't quite catch me at my best... runny nose + 7000 feet of altitude adjustment = a less than coherent Tamara. My body does NOT like the cold! And speaking of Sundance...several docs up there dealt with environmental issues, and all shared the common themes of acting locally and beginning with small steps. Flow: For Love of Water dealt with the looming water crisis. I'm familiar with water pollution issues, but learned a lot about the effects of H20 privatization - it scared the crap of out me. In Fields of Fuel, activist Josh Tickell advocates the use of biodiesel fuel, and uses it as the jumping off point to explore our dependence on oil and to showcase current solutions. Trouble the Water, a personal account of surviving Katrina, and I.O.U.S.A., about the national debt, are not directly about the environment, but you can't help but connect the dots once they are put in context. "Another item, which was inspired by our own Nick Cassidy's initiative to narrow the margins of our paper documents, along with a few other efficiency strategies, has allowed us to reduce the number of pages in the consolidated document from 382 pages to 340, even with the addition of 7 pages in the Version Control Document. That's a whopping 12 percent less paper, impressions, energy, landfill space, printing time, etc." I have no idea what the Version Control Document IS, but I'm all for the 12% cut in waste! According to Cassidy, there are a lot of forms used at State (gee, a government office that generates a lot of paperwork? What a surprise! ), so this kind of change has the potential to have a sizeable impact. Ok, so I don't know exactly how this happened, but the signatures on the Microsoft petition have doubled in the last 24 hours! I'm assuming that a high profile site linked to it, but I've done a search and can't find a new posting about the campaign in the last week. If anyone can shed light on this, please share! One of my biggest frustrations in working on this campaign has been in trying to find the right stats to pass along when people ask for help in taking the idea to their companies or schools. The internet is an amazing place, but as we all know, you can waste a TON o'time searching and searching and searching and still not finding exactly what you need. Yesterday, I finally hit paydirt! I followed a link on the "Experts" section of The 11th Hour website to Forest Ethics. After nosing around there for a bit, I found a report which mentioned a bunch of facts & figures, all credited to a paper calculator created by Environmental Defense. It's an amazing tool that allows businesses and individuals to easily figure out the impact they could make by reducing various factors in their paper consumption. There are also a ton of reports from the initiatives the company has worked on, so I'll be spending some time with those this weekend mining them for facts and figures relevant to my own li'l project. One of the things I'm learning on my grassroots adventure is the importance of numbers and statistics. They're slippery little fellas! You need numbers - irrefutable numbers - to convince companies it's fiscally worth it to change corporate policy. And a lot of research has been done on the impact of the paper industry on the environment and on how using recycled paper will save trees, cut down on emissions, etc. However, these number are scattered across the cyber-universe in a rather unscientific manner, so trying to put them together in a comprehensive document that can stand up to scrutiny has been challenging. If anyone knows a statistician with some spare time on his/her hands, please send me their contact e-mail address! What HAS been encouraging are the emails I've been receiving with suggestions and requests for more info to spread the Margins idea around. I'm almost done with a sample letter that one can use to bring to their company supervisor or IT Department, and hope to have it posted within the next week...just trying to get the numbers to make sense (did I mention I'm having horrible flashbacks to my high school calculus class? ).